Cursed from birth, Chunchu is the holder of the demon stone which renders its host invincible. Abandoned by his father and raised by a people not his own, the young man, whose name becomes synonymous with bloody massacres, arouses only fear and hatred wherever he goes. He has however decided to try to understand why such a destiny was reserved for him, but his twin brother is having none of it. Note: Series is curentlly on hiatus, due to an internal fight between Kim Sungjae (author) and Kim Byung Jin (artist). Both said that they will not end Chonchu. 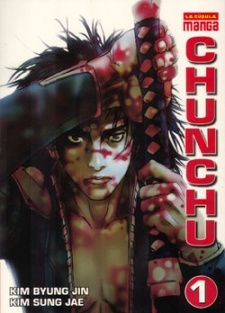 Chunchu: The Genocide Fiend was partially published in English by Dark Horse, who published the first three volumes from August 8, 2007 to February 6, 2008, before dropping the license. Volume 4 Release Date: January 2009? !